Hello everybody! 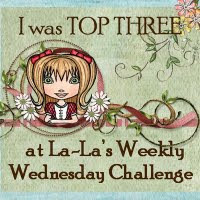 It's time for La-La's Weekly Wednesday Challenge! Before we move on to this week's challenge, we want to thank everyone again who participated in the paper piecing challenge last week. Congratulations to the Top 3! 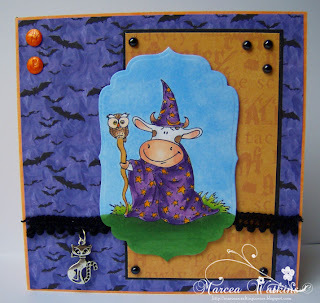 This week, we have a medley of challenges for you from our Guest Designer Team! We asked each of them to add something different to the group challenge. Just to sum up.. 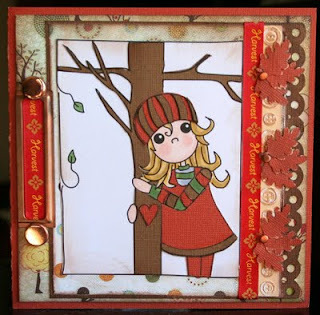 Your project should have two different patterned paper in red/brown/cream, it should have dry or heat embossing, scallops and paper piercing. Sounds like fun? The design team will select their top 3 favorites for each challenge. The one with the most votes will also get 25% off at the La-La Land Crafts online store! 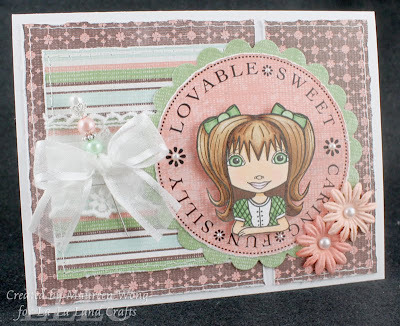 You may use any stamps, but if you've got some La-La Landstamps, why not show them some love! 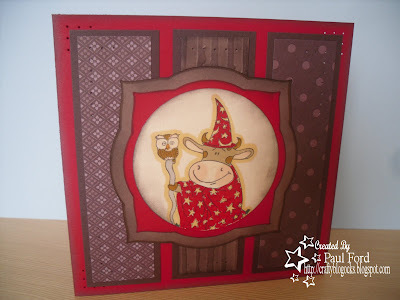 Be sure to link directly to the blog post featuring your entry or to the gallery picture of your entry. 5) Link to this challenge in your blog or gallery post by Sunday, October 4th at 11:59pm PST(GMT-8). 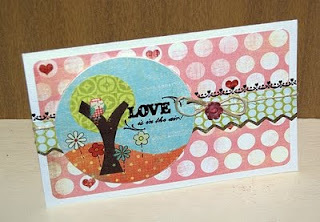 Note: If you do not have a blog and do not upload to Splitcoaststampers, you can still play along. 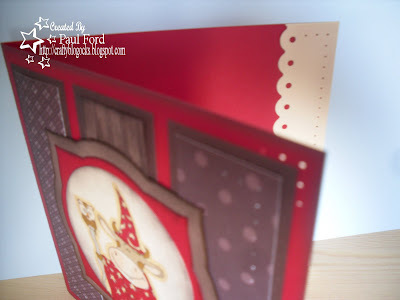 Just email us your card/project and we will enter it into the challenge. Email address is on the sidebar. LLWWC6 "Paper Piecing" was hosted by our Design Team member, Sheila. 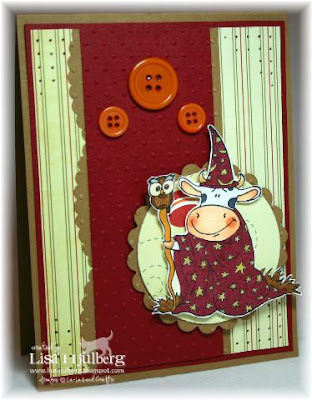 Irina, the Design Team members, and our Guest designers have all turned in their votes. It seems like every week, the votes are very close! Here are this week's TOP PICKS! 3) We have a tie! 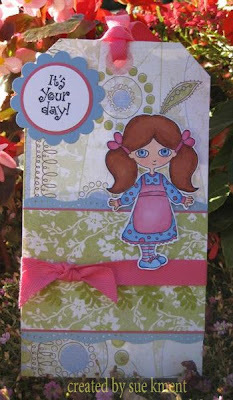 Katie, as the top pick you also get a 25% discount at our La-La Land Crafts store!! Please send Irina an email and she will let you know how to take advantage of the discount. Be sure to come back tomorrow for our new La-La's Weekly Wednesday Challenge! Don't forget about the September Special! You have until tomorrow to take advantage of it! 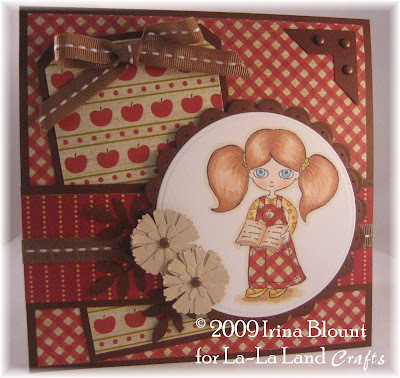 FREE Shipping Offer in our La-La Land Crafts online store!! We are going to the Show!! 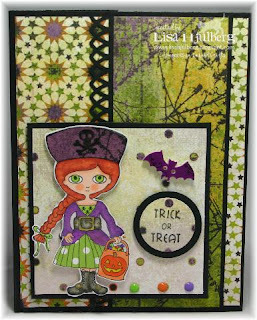 Weekly Challenges at La-La Land Crafts, this week's challenge is Paper Piece It!! For details and to enter check out this post. 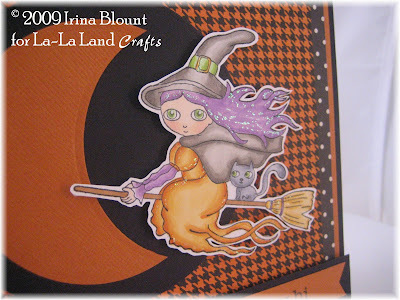 La-La Land Crafts Halloween stamps are now available in our online store, here is the link. 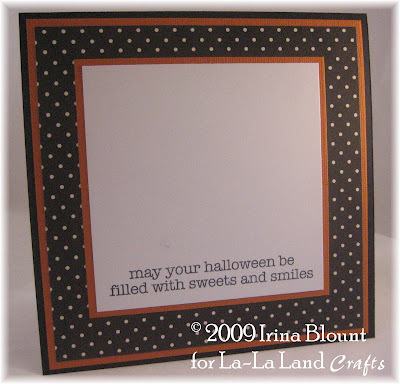 La-La Land Crafts Shipping Special for the month of September!! All orders over $50 within US receive FREE Shipping, our International friends will receive a shipping discount. Here is the link to our store. 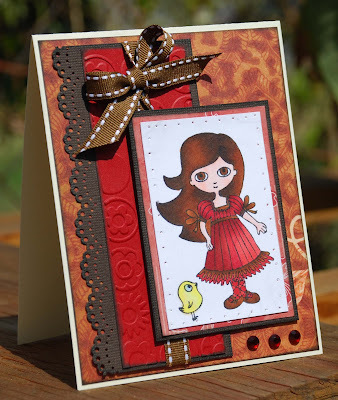 The store is bringing our La-La Land Crafts stamps to the show too!!! 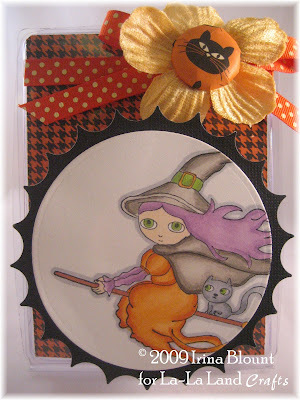 And, I will be doing a Make-and-Take with one of our new Halloween stamps. The photos of the Make-and-Take are below.. It is an altered plastic container!! Cute, cute, cute!! Double sided Reminisce paper. Inverted scallop Nestabilites. Rosie is colored with Copics. The big brad with the cat in the center was made with the Build-a-Brad tool (we will have the tool for sale in our booth!!!). The brad was made with the same designer paper, how cool is that!!! You can make your own brads to coordinate with your projects!! JustRite stamp on the back of the container. 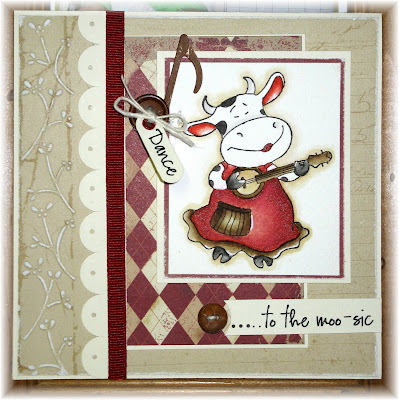 We will have tons of JustRite stamp and accessories at the show. Oh, and we are going to have some of these empty containers for sale as well!! 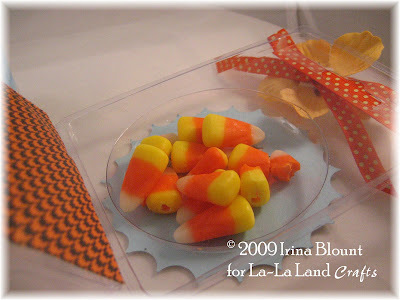 You can alter it as you wish and create your own Halloween treat!! 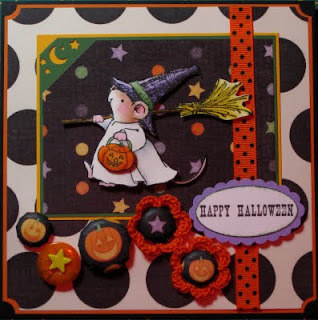 If you are coming to the show, make sure to stop by the Stamp On Over booth to make this cute Halloween project or just to say "hi". Here is the link to the show with more information. Hello everybody! I'm Sheila and I am your host this week! Before we move on to this week's challenge, I want to thank everyone again who participated in the Embellish it challenge last week and congrats to the Top 3! 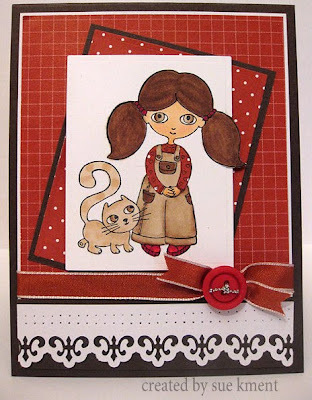 1) Create a NEW card or other papercraft project for the challenge.Yes, you may combine challenges!You may use any stamps, but if you've got some La-La Landstamps, why not show them some love! 5) Link to this challenge in your blog or gallery post by Sunday, September 27th at 11:59pm PST(GMT-8). Don't forget to link directly to your blog or gallery picture no later than Sunday, September 27, 2009, at 11:59 pm PST (GMT -8). Please also leave a comment after you link your project. Thank you! LLWWC#5 "Embellish It" was hosted by our Design Team member: Maureen. 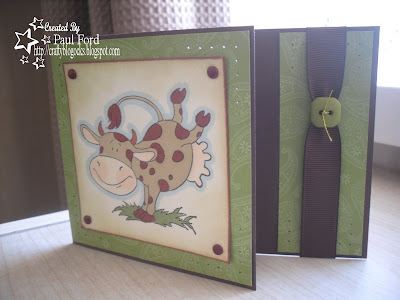 Irina, the Design Team members, and our Guest designers have all turned in their votes. There were so many wonderful entries to choose from! #2 - It's a TIE!! Victoria, as the top pick you also get a 25% discount at our La-La Land Crafts store!! Please send Irina an email and she will let you know how to take advantage of the discount. Don't forget about the September Special! Details are on our website.. 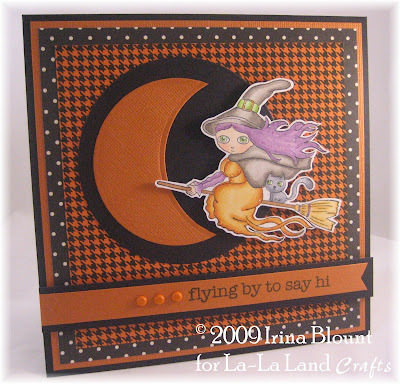 This card was done with one of our new stamps from the just released Halloween Collection, Flying Witch Rosie. 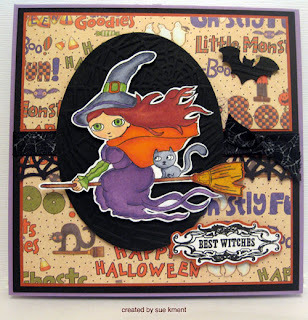 You can purchase this and other Halloween stamps in our online store, here is the link. 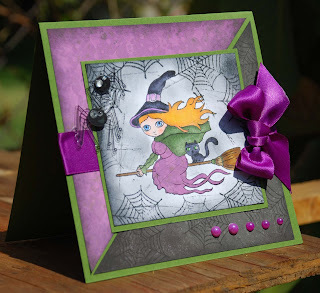 Weekly Challenges at La-La Land Crafts, this week's challenge is Embellish It!! For details and to enter check out this post. Rosie was colored with was colored with Copic Markers, cut out and popped on foam tape in front of the moon. Designer Paper is from Reminisce. Circle and the moon behind Rosie were cut with Circle Nestabilites. 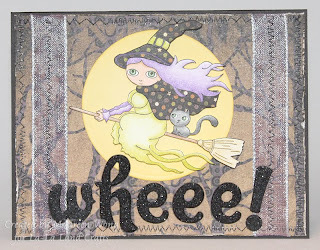 Both of the sentiments (on the banner and inside of the card) are from the clear stamp set by Hero Arts called "Halloween Halloween". 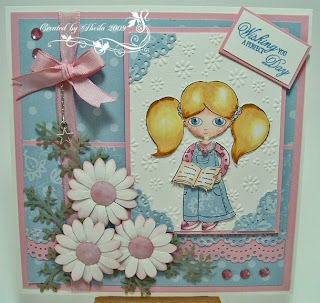 Weekly Challenge at La-La Land Crafts, this week's challenge is Embellish It!! For details and to enter scroll down to the post below or click here. We have a Shipping Special during the month of September!! Orders over $50 receive FREE Shipping within US, International orders receive a shipping discount. 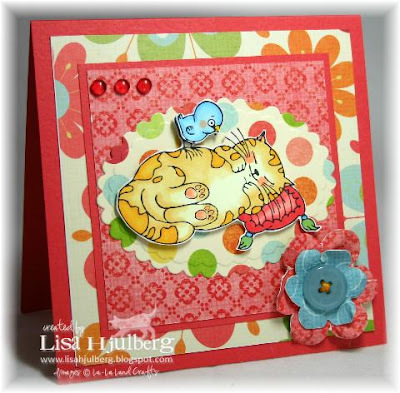 The card below was made with Sitting Rosie with Cat from our First Release Rosie Collection. 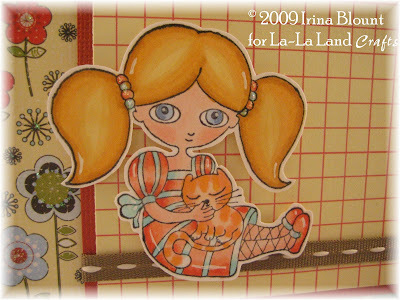 You can purchase this and other La-La Land Crafts stamps in our La-La Land Crafts online store. 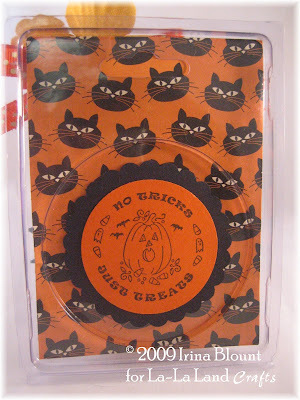 Halloween stamps are now available too!! I kept the layout simple to let the image stand out. Really love how these different papers look together. Rosie image was colored with Copic Markers, and popped on the card. 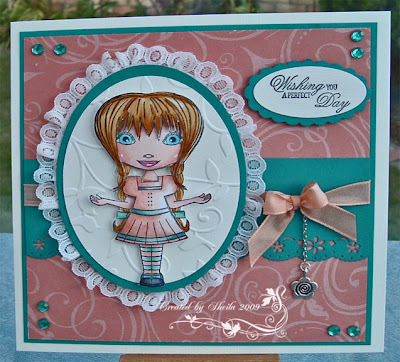 La-La's Weekly Wednesday Challenge #5 - Embellish It! Hello everybody! I'm Maureen and I am your host this week! 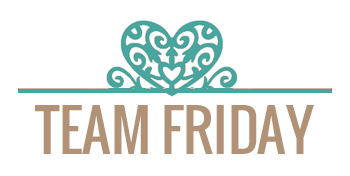 Before we move on to this week's challenge, I want to thank everyone again who participated in the Distressing challenge last week and congrats to the Top 3! 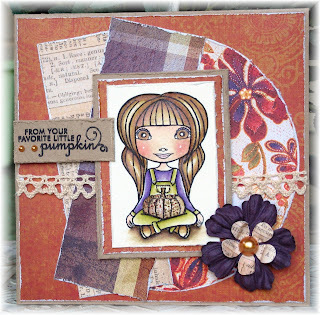 This week's challenge is to "Embellish It!". 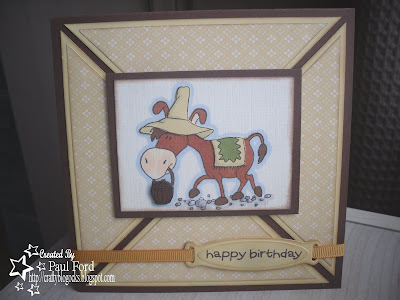 I love to embellish my creations so I want to see how you all embellish yours! 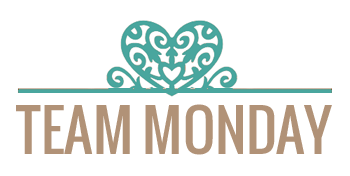 Please use at least 3 different types of embellishments on your projects this week. They can be anything - buttons, ribbon, charms, brads, flowers, glitter, etc., as long as you've got 3 different types! I hope you have fun with this challenge! 5) Link to this challenge in your blog or gallery post by Sunday, September 20th at 11:59pm PST (GMT -8). Don't forget to link directly to your blog or gallery picture no later than Sunday, September 20, 2009, at 11:59 pm PST (GMT -8). Please also leave a comment after you link your project. Thank you!